While some of the book might just be a bit outdated, there is still plenty to relish. So true. As with martyrdom, it must be a spectator sport to be effective. I am sure there is SOMETHING more depressing that a pink nitie! Anything CAN happen, like a home invasion. "Be a Communist, a stamp collector or a Ladies aid worker, if you must, but for heaven’s sake be something!" I so love this book! I live alone and love it, but just to insure my standing I am going to rush right out and become a Communist before settling into my pink and trailing nightgown. 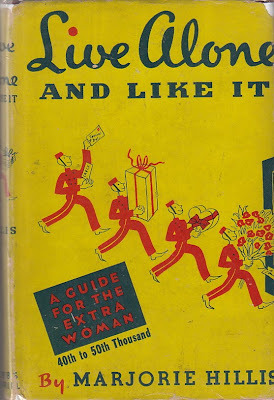 Marjorie Hillis did a cookbook entitled Caviar and Corned Beef for the Live- Aloner. Check it out at Cookbook Of The Day. It is really hard to believe that this was written in the 1930's. Aside from the obvious "dated" materials it is totally relevant. And I am an only child, so living alone has been a constant. Thanks, for following the blog!